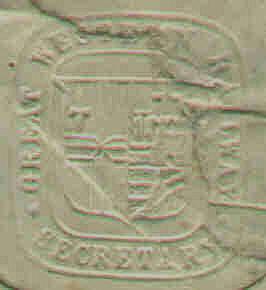 Is This The Earliest Railroad Perfin Cover? In the Britain of 1825, the opening of the Stockton and Darlington line was an event that would lead to the development of the railway as a means of commerce. This caused forward thinking merchants in Britain, most notably in Bristol, to give thought to the creation of a railway to London to facilitate business. A committee was formed in 1833 to discuss the proposal of laying a railway to London. As the idea took form, money was spent to find an "engineer-in-chief" and formulate plans for this railway. A brilliant young engineer, whom many say was one of Britain's best, was chosen. His name was Isambard Kingdom Brunel. In the same year the railway was named the "Great Western Railway". Brunel quickly drew up a plan for the route from Bristol to London. After approval from the directors of the newly formed company, a detailed survey was made to generate a prospectus. This prospectus, complete with map, showed Brunel's chosen route running north of Marlborough Downs via Reading and Bath. This route was chosen over others as it offered better gradients and because if would permit later extensions to Oxford, Gloucester and South Wales. West of Reading the railway would follow the Thames and would pass through the valley of the Chilterns. The railway would then proceed west to Swindon slowly ascending over a slight gradient. The Bill for the railway's construction was passed in the House of Commons only to be rejected by the House of Lords. Undaunted, another Bill was drafted and after much opposition was passed and the necessary royal assent obtained. Work began immediately and almost as fast, difficulties arose. One must remember that in 1835, all of the excavating and construction of the embankments, tunnels, bridges, etc. was done manually. Some of the more significant problems and their solutions follow. The Brent Valley, the Thames at Maidenhead and the hill at Sonning between Twyford and Reading had to be crossed to complete the Reading to London run of track. Brent Valley was crossed by a 960 foot long viaduct, the Maidenhead bridge was erected (of which the elliptical spans are said to be some of the most remarkable ever constructed in brickwork) and the hill was overcome by a two mile long cutting (at points some 60 feet deep). Brunel also recommended the use of the "broad gauge" for the railway. This seven foot one quarter inch scale was a radical departure from the other gauge in use, the "narrow gauge" of four feet eight and one half inches. Brunel chose the broad gauge for stability and for its ability to achieve faster speeds. Another departure from the accepted norm was Brunel's decision to use timber instead of stone blocks to support the rails. This change cost Brunel considerable time until he found a method to keep the track steady. The London terminus was another problem. The decision was made for the Great Western Railway to have its own terminus versus sharing the terminus used by the London and Birmingham Railway. These alterations of plan meant that the Parliament's sanction had to be obtained and the investors risked significant financial losses as they had already begun work on the Acton to Paddington segment of railway. As a footnote, the Paddington terminus was completed in 1854. On June 4th, 1838, the Great Western Railway officially opened (although the Maidenhead Bridge was unfinished). The first public train comprised three first class and five second class coaches and a truck carring a post-chaise. The train carried 1479 people that first day and took in the sum of 226 pounds. To make this cover more relevant to the story, let's discuss the broad gauge track. During the years, 1838 to 1869, the Great Western Railway came under fire. The Gauge Regulation Act of 1846 sealed the fate of the broad gauge by declaring that any other gauge of track than the narrow gauge could be used only under special authority. However, there were exemptions given to a few lines of track that permitted them to be laid down as broad track. In 1861, the Great Western Railway began using narrow gauge track in a "mixed" gauge system. In plain language, there were three rails running parallel, one set the equivalent of the broad gauge and the other set the equivalent of the narrow gauge. The center rail was shared. 1869 is significant in that the Great Western Railway decided no longer to continue the mixed gauge and to use the narrow gauge exclusively. The earliest date recorded in any perfin reference for any railroad cover is 1871. With perfin use beginning in 1868, it is logical to assume that railways were using them almost from the beginning. 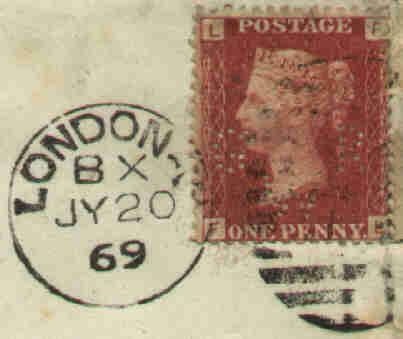 This is substantiated by the early plate numbers on penny reds found with the Great Western Railway's perfin. 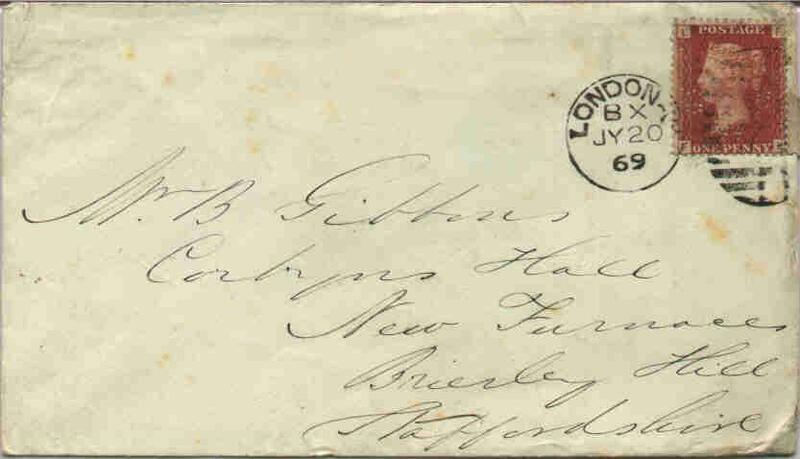 This cover is dated in July 1869 and is the earliest railroad perfin cover I have personally seen. The user is positively identified by the embossed information found on the flap of this cover. 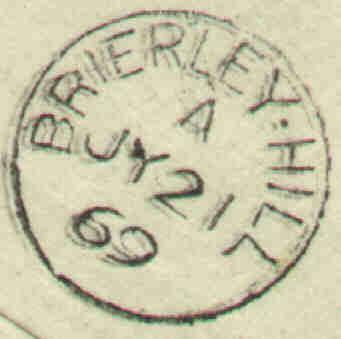 The cover was received in Brierley Hill on the following day. Note that the perfin pattern is illustrated above. 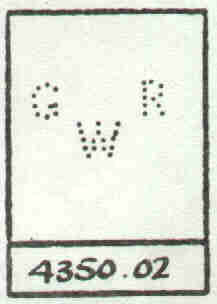 As a footnote, it has been thought for some time now by catalogers that this pattern was the earliest of the Great Western Railway's perfins in use and should have been given the .01 extension vice the .02. The only kink in that theory, until now, was that the previous earliest known cover was dated in 1879. This cover could set things to right given that now other earlier covers are found for the other patterns. I have seen one other early Great Western Railway perfin cover since I purchased this one. The other cover, although earlier than the catalog date was used in 1870. I would be most interested in hearing from anyone who has other early covers of this or any railroad perfins. Email me!